LiveNation: Take Our Tickets, Please! 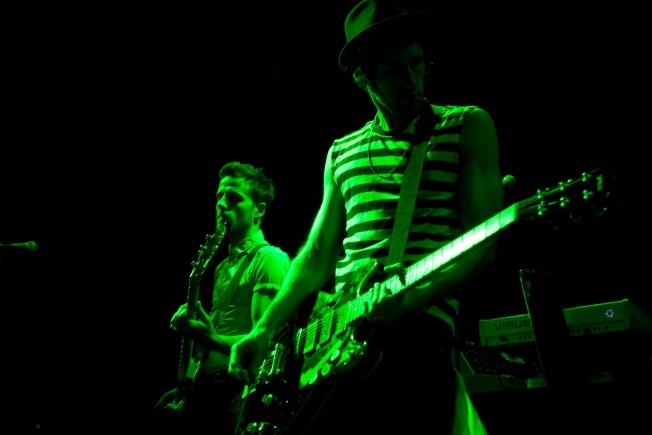 The Bravery performing at a free show this summer. Were you thinking about checking out a local Bravery show? Is it 2007 -- and are you 13? For one day only, LiveNation is offering 2-for-1 deals on some 350 of your could-have-been favorite bands Wednesday. So right. But if you are the sort who enjoys picking through the bargain-bin CDs of last year's one-hit wonders and the latest from bands who put out a good album back when you were in college, then has LiveNation got the deal for you. Who are these bands? Well, there is the aforementioned Bravery, bravely staging a comeback tour (it was an honset mistake). And hey, if you are all for second chances, (and who isn't, these days?) there are also cheap-o Hanson tickets up for grabs. And they are so a real band now, so don't be a hater. One of them is even in a jokey alt-rock supergroup. The site also boasts about the Used and Pit Bull being on sale, and there sure are bargains to be had. Especially if you are really into Papa Roach. But hey a cheap night out is a cheap night out.